We’ve mentioned before how action movies are a guilty pleasure for us. So when the opportunity to create a recipe for Sleepless with Jamie Foxx came up, we were all in. See what we did there? Action movies and cocktails seem to go hand in hand, especially when the film is set in Las Vegas. Hence, why we created The Deep Cover. 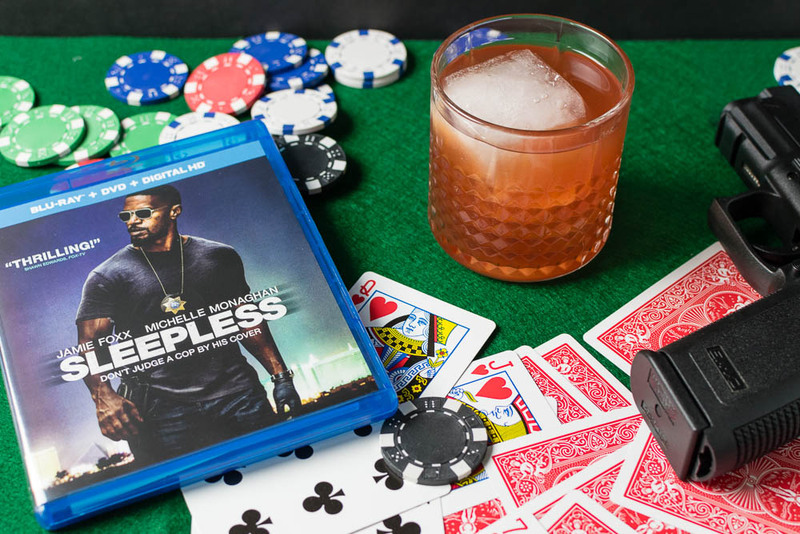 In Sleepless, undercover police officer Vincent Downs (Jamie Foxx) thrives in the high-stakes web of corrupt cops and the mob-controlled casino underground of Las Vegas. 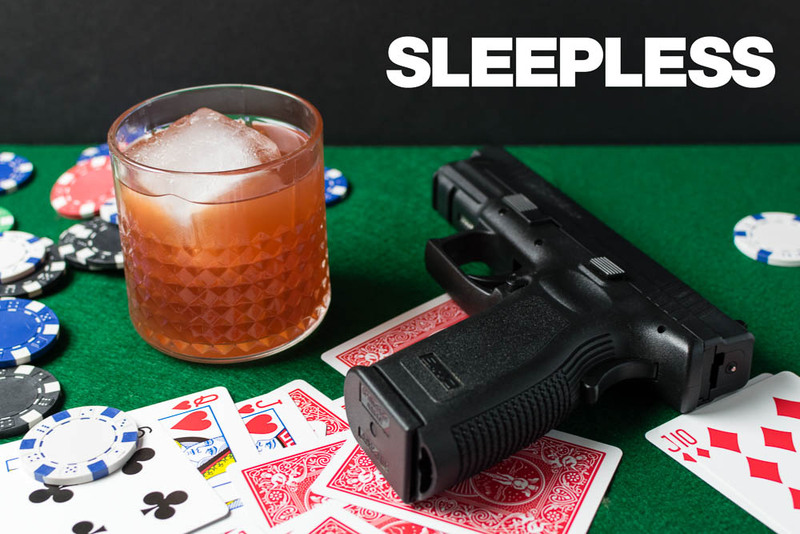 But when a heist goes wrong and a crew of homicidal gangsters kidnaps Downs’ teenage son, Downs must evade an internal affairs investigation, rescue his son, and bring the kidnappers to justice all in one pulse-pounding, action-packed sleepless night. If you like action flicks, then you will really enjoy this movie. Car chases, guns, and ample fight scenes make this movie a true to form action film. Jamie Foxx also does a really good job, though that isn’t really all that surprising. Now onto our cocktail. The Deep Cover’s main ingredient is brandy. We really wanted to create a cocktail that felt like something a high roller might drink but still be inexpensive enough to make at home. Two different types of bitters and Aperol balance out the use of grenadine. It is important to note that the grenadine used in this cocktail is not the standard you see in the store. We used Liquid Alchemist Grenadine. This is closer to a pomegranate syrup so if you aren’t using that grenadine, go with pomegranate syrup. We hope you enjoy The Deep Cover! Did you see Sleepless? Leave a comment below with your thoughts about the movie or if you have a movie you’d like a recipe for. We’d love to hear your thoughts! Cheers! Sleepless is now available on Digital HD, DVD, and Blu-ray. Combine all ingredients over ice in a cocktail mixing glass and stir. Strain into a tumbler with a large cube of ice. The Geeks were provided with an advanced copy of Sleepless for research purposes. Images and title treatments were used with permission. All opinions are wholly our own. View our Disclosure Policy for more info. You can keep the gun but I’ll try this cocktail! My wife and I enjoy creating fun drinks. The sweetness of this one would be a great after dinner drink. This sounds like a cocktail, my husband will love. I have almost everything on the list except for the French Brandy. Making this one this weekend. Looks like a fun drink to share with friends! I have not seen Sleepless..or even heard of it. There sure are a lot of different flavours in this drink. I am a wine person…but this does sound interesting for sure. I haven’t seen Sleepless but am looking forward to watching it! Love movie nights in! This is the first time i m hearing about sleeppess. we are planning for a movie night this weekend guess u gave me a nice opiton for movie. Looks like a dangerously delicious drink you’ve got there! I’ll give it a try, if I find all the ingredients. My hubby is a big action movie fan…so this definitely sounds like it would be right up his alley. Such a fun little cocktail but it really is reminding me that I need to up my cocktail game as I am not familiar with either one of those bitters. This looks like an amazing cocktail! Also why have I not heard of this movie being out? I love me some Jamie Foxx! I’ll drink anything made with Aperol. This sounds amazing, and I’ll have to look into getting those bitters you list in this recipe.